Is Spanish food calling your name? Beef enchiladas hit the nail on the head putting those Spanish cravings to rest. I love that this recipe is simple and manageable to any skill level. It allows for flavor without busting the budget. Also, the author provides a detailed listing of substitutions and nutritional information to keep track of those pesky calories. Simple and tasty, these enchiladas open a whole new world into making low calorie meals delicious. 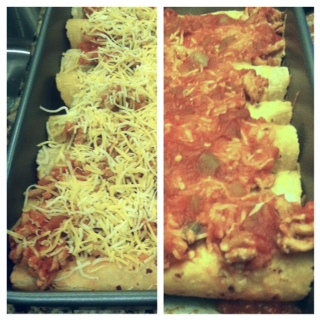 Enchiladas are corn tortillas rolled in a filling and covered in a salsa or chili sauce. The filling can be mixed from a variety of beans, cheese, meat and seafood. Enchiladas originated in Mexico, where the practice of rolling tortillas around other food dates back at least to Mayan times. The people living in the lake region of the Valley of Mexico traditionally ate corn tortillas folded or rolled around small fish. There are now many varieties, which are distinguished primarily by their sauces, fillings and, in one instance, by their form. Various adjectives may be used to describe the recipe content or origin. I suggest doubling the recipe because ground beef is packaged in one pound increments. I was able to make 16 enchiladas. I used the six-inch yellow and corn tortillas. You can use larger tortillas and just make less enchilada. I enjoyed the yellow corn tortillas more because they were a thicker tortilla. I used yellow and orange peppers. These peppers add sweetness to any dish. You can use any type of cheese. I suggest a sharp cheddar or three cheese Mexican mix. I sprinkled the cheese on top of the completed enchiladas before placing them in theoven. I used two cans of salsa, one picante and one organic, mild salsa. I nixed the cilantro because I do not like the minty flavor. I cooked my enchiladas in the oven for only 15 minutes. You just need to cook the tortillas and melt the cheese on top. Ven a probar esta receta! While most Spanish food is a great balance of nutrient rich tomatoes and ingredients, they can be high in calories. However, these beef enchiladas are only 330 calories per serving. You can lessen the carbohydrate intake by using a one semi-larger tortilla and more filling. Try a variety of fillings and combinations to satisfy your family’s growling stomach. With only a few ingredients and 20 minutes, you create a Spanish fiesta. Leave a message with your favorite enchilada sauce and filling. Follow my Pinterest for more recipes. Check back again next Wednesday for more tips and tricks from The Cooking Bug.